This page contains many applets to help you do calculations and to SAVE YOU TIME. Normally, the flow rate is given, it is fixed by the user or the requirements of the process. For a new system the pipe diameter is unknown, with the flow rate and a trial estimate of the pipe size it is possible to see if the velocity will be in the desirable range as given at this page. Head is one of the main characterisitics of a pump. In the imperial system it is measured in feet. If the maximum discharge head of a pump is say 10 meter, the fluid will be able to get to 10 m of height above the discharge and the flow will be zero. 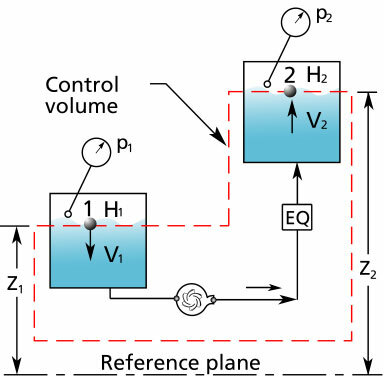 The head of the pump depends on the flow rate and it is zero at the maximum head and diminishes as the flow increases. To verify the discharge head of a pump, a pressure gauge is used. Pressure gauges measure in units called psi or pounds per square inch. The formula gives the conversion of pressure to head. Power is given by the combination of four items: the specific gravity SG, the total head , the flow rate Q and the efficiency of the pump eta . The specific gravity SG is the ratio of the fluid's density to that of water at standard conditions, for water the value of SG equals 1. The total head is normally calculated for the flow rate of the system and depends on static head, pipe friction loss and equipment loss, it can also be measured with pressure gauges. Two pressure gauges are required, one on the discharge and one on the suction side of the pump. The difference between these two measurements is taken and the 2nd formula above is used to convert to head. And finally, the efficiency of the pump must be known, this is usually obtained from the pump manufacturer's total heads vs. flow curve of the pump (see typical pump curve). 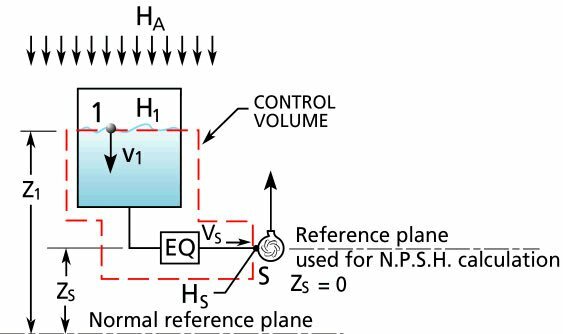 Since more often than not, a pump is driven by an electric motor, it is possible to determine the power consumed by a pump by looking at the power consumed by the motor. The volts V are the volt level that is supplied to the motor. In industrial applications, this is often 3 phase, 575 volts. For residential and commercial installations, we encounter single phase, 110 or 220 volts. If the voltage is single phase then we ignore the square root of 3 in the formula. The amps A is a unit of measuremnt of current and this is normally measured with an ammeter. The efficiency of the motor eta is given by the manufacturer and for a recent motor varies between 0.92 and 0.96. P.F. is the power factor of the motor and is proprotional to the phase difference between the current and the voltage. P.F. has similar values to those of efficiency. Typical values of efficiency and power factor for industrial motors can be found here. For typical values see the pump glossary.